Pairing & Developing Rapport - I Love ABA! “Pairing” is a common term that ABA professionals often use to describe the process of building or maintaining rapport with a client. Therapy often begins with intentional and thorough pairing, where its ALL about what the client loves or enjoys and making that available to them on a non-contingent basis (jargon defined: for FREE). Basically, the therapeutic relationship should start off with low demand, and high reward. When done correctly, the client will see the ABA professional walk through the door and connect that to receiving good things/having fun. I have mentioned pairing before on my blog, but this is the first full post all about pairing. 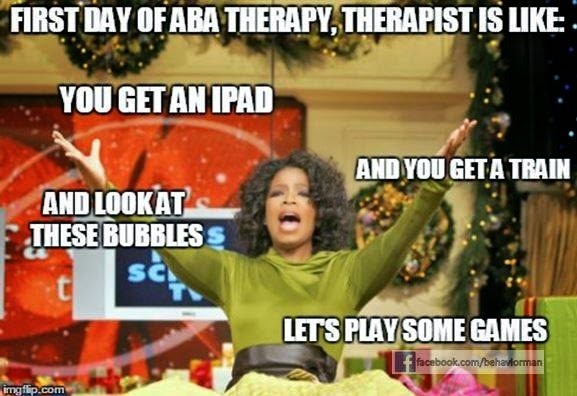 Pairing is one of those ABA activities that some therapists just LOVE to do, and some therapists find challenging. I can't tell you how many times a therapist has said to me "...But, I don't know how to pair with him". I think this is because so much of pairing can be unstructured, client-led, and loose, that for some individuals it feels like doing nothing. Or it feels like wasted time. I have even had parents complain to me that the staff is "just playing" with their child and need to get to work already. I have also worked with ABA therapists who are amazing at pairing and building rapport. One of my previous staff referred to herself as "Mary Poppins on crack". :-) Correctly so, I would say. Pairing in its simplest terms is just being the embodiment of a toy. When I am successfully paired with a child, I feel like a gigantic toy. The child is pushing and pulling on me to get me to engage with them, ordering me around (“No, sit with me over here!”), excited to see me arrive and bummed to see me leave, responsive and cooperative during work tasks, and and any activity is more exciting if I engage with it too. The therapeutic process should begin with intentional pairing. By begin, I mean when initially meeting the child or at the start of each therapy session. Pairing is how therapists establish instructional control and connect themselves to reinforcement (eventually becoming a reinforcer). Skipping the pairing process can cause problem behaviors to increase, kill instructional control, and impair the therapist-child relationship. If I am not properly paired with a new client and I just walk in and start giving orders, what is motivating the child to do what I say? What is motivating the child to want to come and play with me? What you could unintentionally do is create a situation where the child is doing things you ask to get away from you. So you place a demand, the child answers, you provide reinforcement, and the child walks away/leaves the room/elopes. That is definitely NOT a situation you want. It’s no fun for you or the child to have to chase them around the home. You will know pairing has been successful when the child is consistently coming toward you, or approaching, and not walking away from you, or escaping. The whole "Im-going-to-play-alone-with-my-back-turned-to-you" thing is like a red flag that you have more pairing to do. Pairing is all about social reinforcement and enthusiastic engagement, which is often hard for the children I work with. They just don't find social interaction all that interesting. Pairing is not something you do for a few days/hours/weeks ( I have heard all kinds of pairing formulas) and then never do again. I've worked places that taught us pairing rules like: pair for the first 5 sessions, or the first 2 weeks, and then transition to placing demands. Research does not support these kind of blanket rules. Think of pairing as something to be implemented prior to task demands, not just when starting with a new client. I teach my staff to briefly pair at the top of all therapy sessions, and to continually conduct brief reinforcer preference assessments to make sure they are approaching the client with what that client wants, in that moment. This is a far more effective way to think about pairing......it is not something to check off a list and then never do again. Its a way of embedding client interest and just good ol' FUN into your sessions, so that work is gradually embedded into play, rather than being a jarring transition. There is one last benefit of the pairing process that I feel is sometimes overlooked. Successful pairing teaches the child that I am fun and when I show up at the house good things happen. So in the future if we have a bad session or the child hates a program I am trying to teach, they can separate the task I am asking them to do from who I am. In other words, they can dislike what I want them to do and still like working with me. Here is a simple mock up of the first few days of pairing with a new client, and what that progression could look like. Day 1: Introduce myself to child. Observe the flow of the day and how the child spends their day. Act more as an observer than an active participant. Shadow the parents as they engage with the child so I am connected to reinforcing people (the parents). Place 0 demands on the child. Day 2: Greet the child. Begin to connect myself to known reinforcers. If child loves to swing, push the child on a swing. If child loves going to the park, take the child to the park. Praise appropriate independent behaviors, such as eye contact or sharing (“Thanks for sharing with me!”), and have lots of playful interactions doing what the child wants to do. Do lots of narrating or mimicking during the play. Follow the child’s lead. Introduce some task demands in the work area. Day 3: Greet the child and begin to prompt a response. Restrict access to reinforcers by being the one in control of reinforcing items. Spend more time in the work area, or increase ratio of demands to breaks. Begin to incorporate social reinforcers into play such as having a babydoll give the child kisses. Praise appropriate independent behaviors, such as eye contact or sharing, and have lots of playful interactions doing what the child wants to do. Day 4: Greet the child and wait for them to respond. Arrive to the home with a Grab Bag of reinforcing items to introduce during the session. Restrict access to the reinforcers by placing demands on the items. For example if the child wants a pinwheel out of the Grab Bag require them to spin the pinwheel once (prompt if needed), then immediately praise the spinning and give the pinwheel to the child. If the child is vocal begin to require they label reinforcers to get them (hand the child a ball but don't release it until they say “Ball”). Increase amount of social reinforcers used during the session to a few each hour; label the name of the activities as you do them. For example, lift the child into the air and say “You’re an airplane!” Begin to have the child follow your lead, e.g. As you are playing with the child on the floor stand up and yell “Chase me!” and then run into another room. Reward the child following your lead with tickles. I am a parent of a child receiving ABA and was wondering how long it should take for a service plan to be drawn up. My son is currently in his 3rd week of ABA with a new BCBA and she still has not shared a plan with us. His last ABA and BCBA worked with him for an entire month but took no data. I keep getting told that this is because they are still pairing. It is true that many providers start off treatment with either pairing or continued assessment (behavioral or skill assessments). To a parent, this can look like the providers are just playing with the child or just collecting data and wasting therapy time. However, it is a highly important part of beginning treatment and shouldn't be skipped over. It sounds like your provider has been taking the time to work on pairing (and possibly further assessing) first, but you are unsure how much longer this will take. Only the BCBA can tell you that, as he/she is the one designing the treatment. It could be delayed due to other reasons you're unaware of, for example needing to take more time to create staff training materials if the staff need more training or support. I suggest asking the BCBA directly what the timeline is for pairing, when you can see the treatment plan, and when the therapists will start implementing the plan. I have my team collect data throughout pairing, and that is how I determine when to transition into demands. If your team is not collecting any data, I am not sure how they would know when to transition into work demands. That is something only your BCBA can answer.